Butler's Heidi Bednarz clears a height in the pole vault during the Golden Tornado girls track and field team's 90-60 win Tuesday afternoon over North Allegheny. WEXFORD — Just another day at the office for Liz Simms. 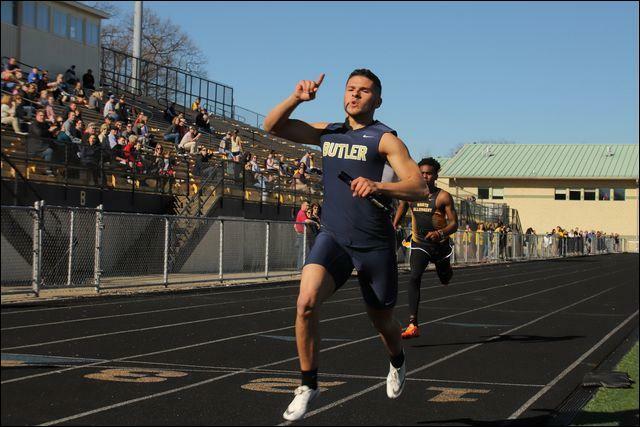 The Butler senior won the 400 and 800 meter events, anchored the 4x800 meter and 4x400 meter relay victories as the Golden Tornado girls defeated North Allegheny, 90-60, in a critical early season meet Tuesday at Newman Stadium. “I'm going to miss this rivalry,” Simms said. “It's always such a big meet with a lot on the line. Gabby Boden, Chesna Tomko and Taylor Timmons ran the three legs of the 4x400 in front of Simms. By the time she grabbed the baton, Butler had a huge lead. She had plenty of help in this meet. Tabitha Wilbert and Anna Baxter both set personal records in the 100-meter hurdles and Baxter won the 300 hurdles. The Tornado's Emma Stewart and Gabby Boden finished second and third in the 100 meters. 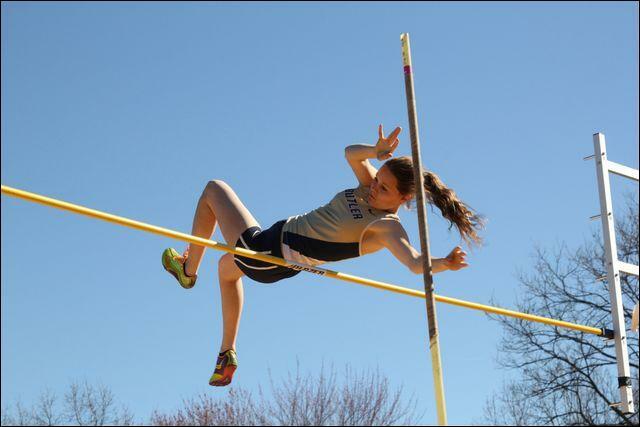 Butler swept the discus and pole vault events to cement the team win. “Andrea Jones placed third for us in the discus and she had never scored a varsity point before this meet,” Williams said. “Those points are so important in a competitive meet like this. Butler’s Ryan Marcella celebrates after crossing the finish line ahead of North Allegheny’s Joey Porter Jr. to help the Golden Tornado 400-meter relay team.